Eddie Dunbar is enjoying a seamless transition from youth to junior-senior racing, with his triumph in Coachford today the latest in a series of very strong wins so far this season. Eddie Dunbar has stormed to his second solo win in as many weeks when he obliterated the field in the inaugural Coachford Classic in the Cork town this afternoon. The O’Leary’s Stone Kanturk CC rider signalled his intentions on the first of seven laps when he broke clear with Ryan O’Donovan (Cork County CC) and two more, but that move was brought back around half a lap later. And as soon as it was recaptured he jumped away again, this time taking just O’Donovan with him. But two laps later Dunbar dropped his breakaway companion and rode the remaining five laps by himself, increasing the gap with every lap. There were a few attempts made to bridge to him but nothing that made any real impact and by the finish, the first-year junior – who will represent Ireland at the Junior Tour later in the summer – had over three minutes on the bunch. They were led in by Fermoy’s Stephen McGrath who had a few seconds to spare on a fragmented bunch. The course – featuring two sticky climbs – was right up Dunbar’s alley and right from the drop of the flag he was attacking, again and again. The heavy rain that fell just before the start did little to deter him. He was the man to watch and he stung the legs of the bunch on the first climb on the 15 kilometre lap course, gapping those behind and breaking away. But with Blarney well represented today – and none of their men in that first move – they shut it down after half a lap. Dunbar went again immediately on being caught and O’Donovan, who would later finish third, went with him. The bunch stalled – relieved that Dunbar had gone away, no doubt – and for a few laps it was a case of catching breath as the gap went out every lap. The weather did dry up and a few chases ensued. Brendan Cassidy – last week’s winner in Kilmihil – was another to try and pull a group away on the climb, while John O’Brien (Ballymore CC) and John O’Connell (Blarney CC) were two others who were very active. Colm Sheehan (Blarney CC) and Eoin Green (Iverk Produce Carrick Wheelers) each tried getting across but they were given very little slack. And so the laps passed with the only real excitement being that O’Donovan – who is no slouch having won a stage of the Corkman recently – got dropped. The final lap saw a few dangerous moves go up the road including Robert Forrest (Blarney) and Ballymore’s John O’Brien. The latter got away for over half a lap, obviously looking for second place. But he was mopped up in the final kilometre, paving the way for the bunch sprint for second, which McGrath won from O’Donovan. The A4 race, run over five laps, was won by Jamie Blanchfield. He also won in Dungarvan last week and will now join the A3 ranks. 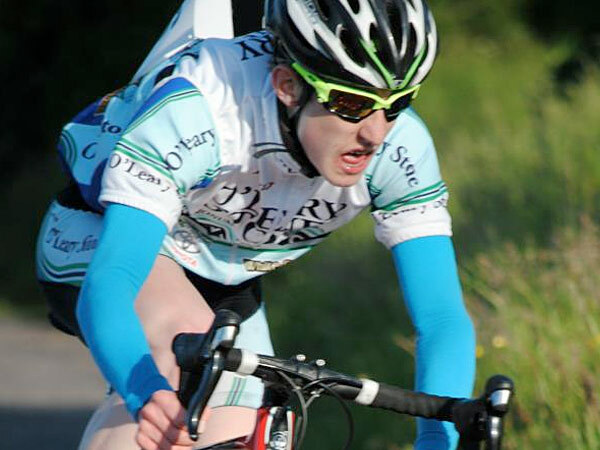 He edged out David Williams of West Cork CC, with Blarney’s Mark McCarthy in third.